The EP!C Sustainable Living Festival happened over the weekend with plenty of fun for attendees. This year's festival was the best by far! Moving to VanDusen Botanical Garden was a brilliant idea and people were able to enjoy the sun, walk around the garden and just enjoy being at the festival. The change in venue really helped people feel happier, more relaxed and the overall event was less commercialized. I overheard many people voicing similar sentiments. There were also many fun things added where they couldn't have been in an indoor environment! A lot of people were just chilling on the great lawn, listening to non-stop live musical performances. Throughout the day, Gardening Workshops were being held in next to the vegetable garden. I didn't know that VanDusen has a vegetable garden! 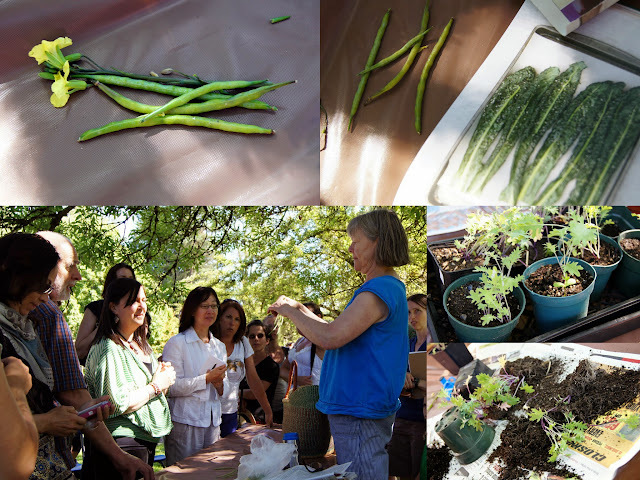 Gardening Workshops were held under the shade. I caught Sharon Hanna giving a presentation about Vegetable Gardening - Backyards to Balconies. Kale, leeks, beans, peas and lettuce are very easy to grow and are recommended for first time growers. After the presentation, she distributed from Rainbow Lacinato kale seeds (she loves this variety) and also Red Russian kale starts. I have both growing in my own garden! I also didn't know that VanDusen has their own bee hives! The bees were all over this plant. Buzz, buzz, buzz. There are a lot of beautiful flowers in bloom around the garden! Nearby was the Maze (kids loved it) and at the Maze Amphitheatre, the Experience 2050: Change Jam Series were taking place. Here people were listening to a talk on Sustainable Purchasing and Production. In addition, VanDusen Garden guides led walking tours hourly, teaching tour participants sustainable approaches in the Garden and how to apply them to their own. I was glad to see lots of Zero Waste Stations around the area. At the Epicurean Corner, people could sample bits and bites from various vendors such as Whole Foods, Honeybee Centre, Eight 1/2 Restaurant Lounge, Terra Breads, and Rain City Soups. Whole Foods was serving up two types of samples. Heirloom tomatoes with fresh basil in balsamic reduction. It was so good! Some one commented that they don't usually eat raw tomatoes and this changed their mind about them! Honeybee Centre has recently opened a shop on Main Street: Main Street Honey Shoppe. Eternal Abundance was giving food demos and people could sample in exchange for some sample tickets. Shrimp and mango ceviche made by Eight 1/2 Restaurant Lounge. Many people were excited about the food trucks at the festival. 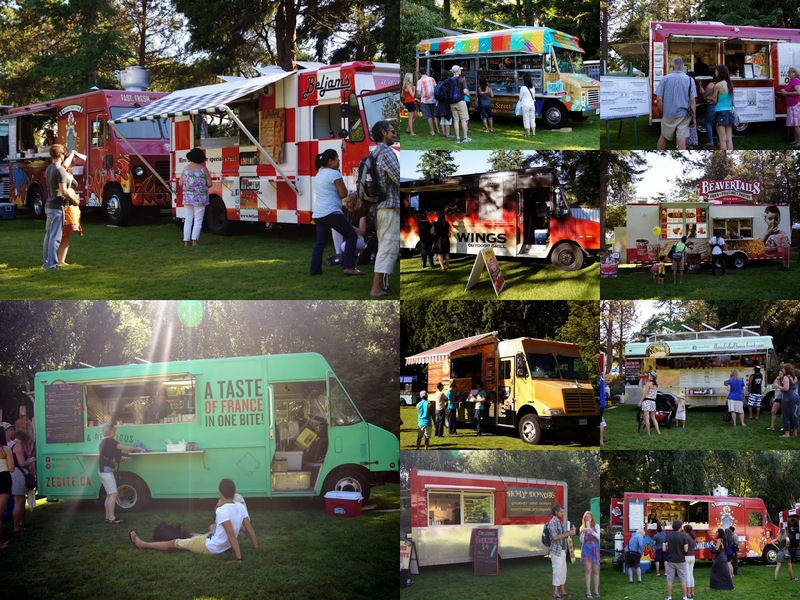 19 food trucks were there serving up delicious foods to festival goers. It was also the perfect setting to eat! Plenty of space everywhere on the lawn. Gratta d'Oro was a food cart I've never heard of before. But since it was pretty hot, shaved ice was sounding pretty tempting. They serve Italian shaved ice and the guys that man the cart are originally from Rome! All natural syrups are used to make their icy treats. I tried the Tropicale - mango & coconut. Those are the syrups they put in. After that they add in real coconut pieces, strawberries and a lemon slice! Mmm! That sure it the spot! 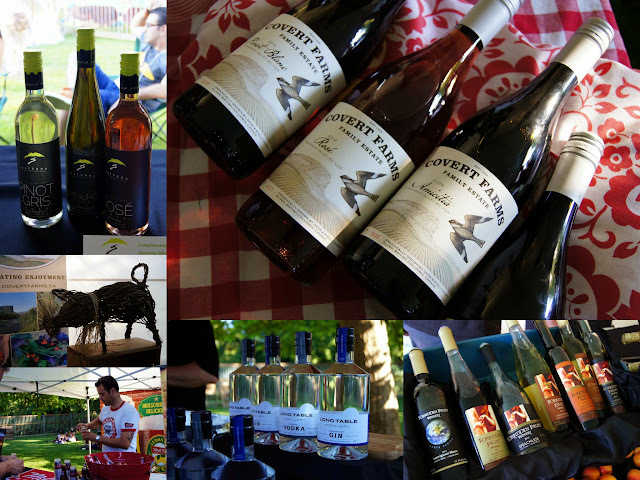 The Sip and Savour area was very popular. Sticks and Stones Furniture provided outdoor fireplaces with seating! and where kids could play with toy trucks from Playmobil. There was also a bouncy castle area! Vendors were outside around the garden as well as in the main Marketplace tent. Nissan was showing off their new Nissan LEAF. It is a 100% electric car with ZERO emissions! Under two big tents was the Marketplace where over 200 vendors offered festival goers samples and awesome deals. Hardbite chips are kettle-cooked all natural potato chips made in BC! They were offering 3 bags for only $5; a steal of a deal I took advantage of! Camelina Oil from Three Farmers. Also a Canadian company, they appeared on Dragon's Den! Free Geek Vancouver is a nonprofit community organization that reuses and recycle donated technology. They take all used computer equipment in any condition free of charge! By doing what they do, they reduces the environmental impact of waste electronics! Honeyview Farm honey products, also from BC! Bag to Earth is 100% biodegradable leak resistant paper bags that you can use to line your green bin with. No more messy or smelly green bins! Cartem Donuts with their amazingly delicious mini donuts! Mubiblossoms are eco-hairclips hand-crafted in Vancouver! Coral Skin Care selling volcanic mineral mud for your daily skin care regime. 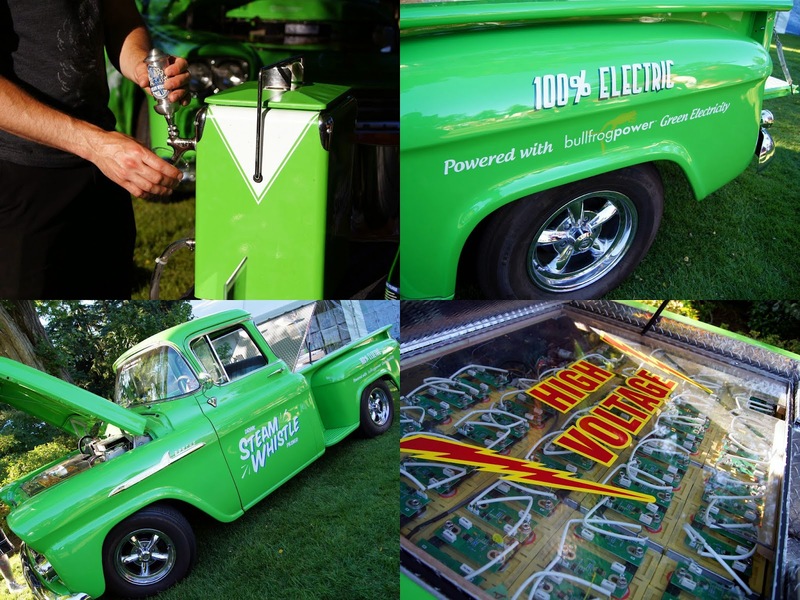 Bullfrog Power, Canada's 100% green energy provider, offers clean, renewable energy solutions to homes and businesses. This is a pretty handy device. It's a solar powered charger for your mobile device! Hippie Granola is made from nutrient dense grains, nuts and seeds instead of instead of filler oats. Floating Stone Silk is a company from BC and works with artisans in Cambodia to produce stunning products in a sustainable way. Sayula is Mexican-Canadian company which provides biodegradable, environmentally and socially responsible bath and kitchen products. Fairtrade organic spices from Arayuma. Profits from Me to We clothings and accessories are donated to Free The Children! The EP!C Sustainable Living Festival was an amazing event and I hope that next year's will also be at VanDusen!